Edmonton Rhinoplasty & nose job surgery. Dr. Keohane has performed 1000's of surgeries with 20yrs experience. Call today 780-428-7824 for a consultation. Click to see a selection of our Before and After Rhinoplasty Photos. Cosmetic rhinoplasty or septorhinoplasty is a surgical procedure offered by The Advanced Facial and Nasal Surgery Centre. The surgery is designed to reshape the nose. The goal is to provide a nose with a pleasing aesthetic or cosmetic appearance while maintaining or improving nasal function. 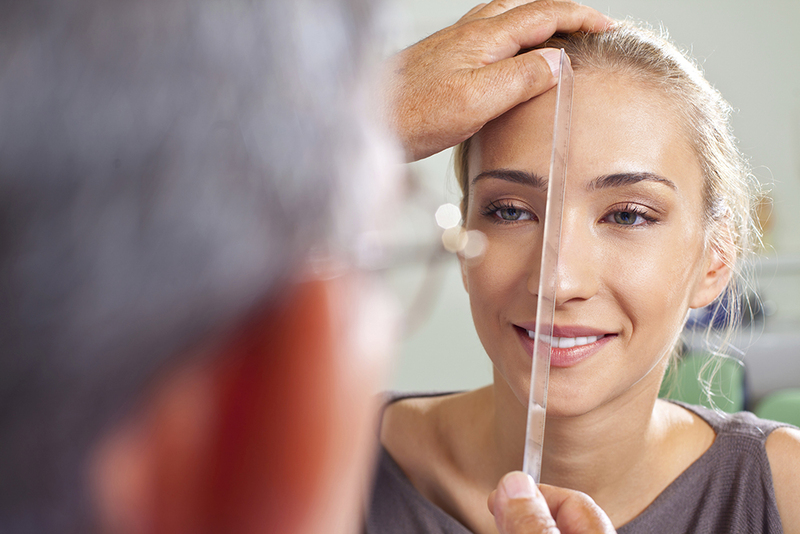 Rhinoplasty, or nose surgery, is sometimes referred to as “nose reshaping” or a “nose job." Nose cosmetic surgery improves the appearance and proportion of your nose, enhancing facial harmony and self confidence. Nose surgery may also correct impaired breathing caused by structural abnormalities in the nose to improve nasal function. While the shape of your nose is usually the result of heredity, the appearance may have been altered in an injury or during prior surgery. In your preoperative consultation with Dr. Keohane, he will carefully examine your nose and describe for you the abnormality as he perceives it. In most cases a detailed endoscopic and video examination is also performed so that you better understand the anatomy and physiology of your nose. Click to review our Rhinoplasty PDF procedure sheet. During surgery, the bone and cartilage of the nose is gradually reduced to provide a nasal shape and form that is appropriate for the patient's other facial features. For example, if the patient has a large bump or hump on the bridge of the nose this is reduced to provide a better side profile. If the tip of the nose is too large then the nasal tip cartilages are sculpted to reduce the overall size of the nasal tip and also to provide a more triangular appearance to the base of the nose. Rhinoplasty can be performed in many instances using an approach where all the incisions are placed inside the nose. This generally leads to less postoperative swelling and a more rapid convalescent or healing period. In approximately 1/2 of cases, due to a severe cosmetic abnormality or a history of previous surgery, it is necessary to use an external or open approach in which a small incision is made in the area of skin separating the nostrils. If this approach is used, the sutures will be removed approximately five to seven days following surgery and the scar should be essentially invisible at a period of six weeks to three months. Most people expect rhinoplasty to be a painful operation, yet, in most instances this is not true. Nasal surgery is a highly individualized procedure and you should do it for yourself, not to fulfill someone else’s desires, or to try to fit some sort of ideal image. Healthy individuals with a positive outlook and realistic expectations are appropriate candidates for this cosmetic procedure. For more information or to book an appointment, contact us. Following surgery a small splint will be placed on the nose. This is removed approximately five to seven days following surgery. In order to prevent postoperative bleeding, the nose is gently packed with sponge packing resembling small tampons. The function of the sponge packing is to absorb secretions immediately following surgery and in the vast majority of rhinoplasties the packing is removed within one to two hours following surgery. Most patients will experience a small amount of postoperative bruising and generally are able to return to normal physical and social activities within ten to fourteen days. The vast majority of healing will occur within the first six weeks however subtle changes to the nasal tip and bridge of the nose will continue for a period of up to six months to one year. After surgery, most patients experience nasal congestion similar to a head cold and will require a minimal amount of postoperative pain medication for the first three to four days. Follow up care is vital for this procedure to monitor healing and it is important you are seen at regular intervals for the first year.